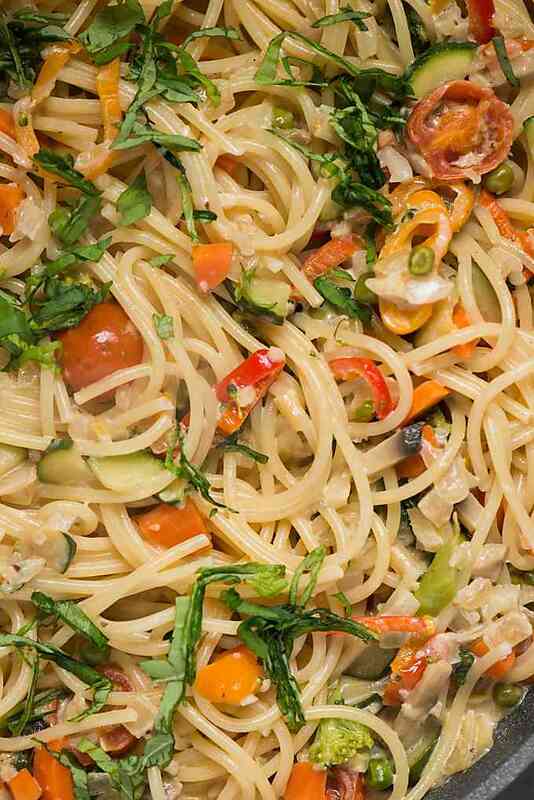 Eat the rainbow with this creamy yet quick and easy to make Dozen Veggie Pasta Primavera! The texture of the pasta and flavor in the sauce is incredible!!! 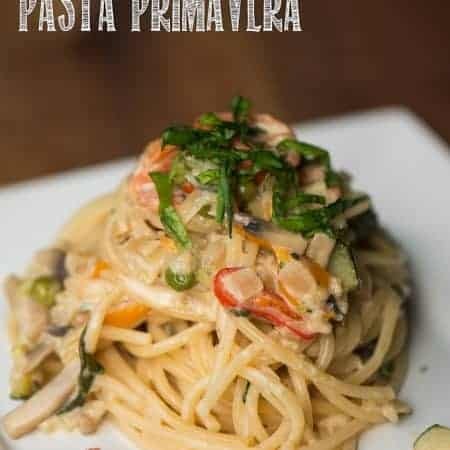 I wanted to make one of my favorite pasta meals – a colorful and incredibly satisfying creamy pasta primavera. 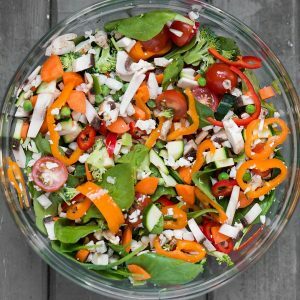 You can totally use butter or olive oil for your fat when cooking up the veggies, but I had just finished cooking bacon for another meal so I figured… why not? Can you believe I had all of these veggies in my refrigerator ready to go? 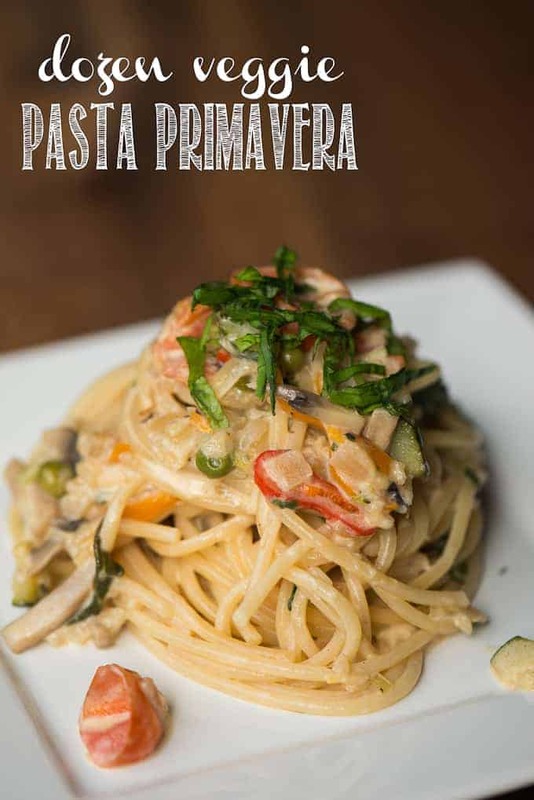 When I decided to make this pasta primavera, I didn’t even have to run to the store. I had everything already on hand. Get this: I had even more veggie varieties in my refrigerator that I didn’t even include. I figured beets turn everything pink. By the time I threw everything in the bowl, I realized I was putting a full dozen into this meal. Pretty awesome. That may seem like a lot of veggies, but they always cook down more than you would think. I was worried about them getting steamed and mushy, but they browned up beautifully and were able to keep a wonderful texture. One thing I’ve learned was that your sauce should always be ready by the time your pasta is done cooking. You never want to drain your pasta and have it sit waiting for the sauce to finish. Use 2 tablespoons of salt per gallon of water for each pound of pasta you’re cooking. I never used this much salt in my water before, but have since started since I learned this trick and, my goodness, what a difference! 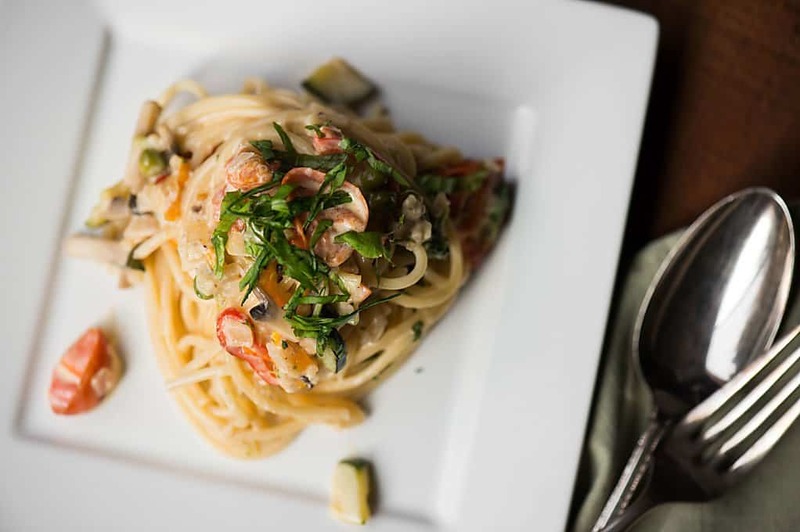 When cooking your pasta, keep that temperature high and the water should remain at a rolling boil. If the recommended cook time is 9-11 minutes, drain the pasta after only 9 minutes of cooking time and combine the pasta with the sauce in the pan. 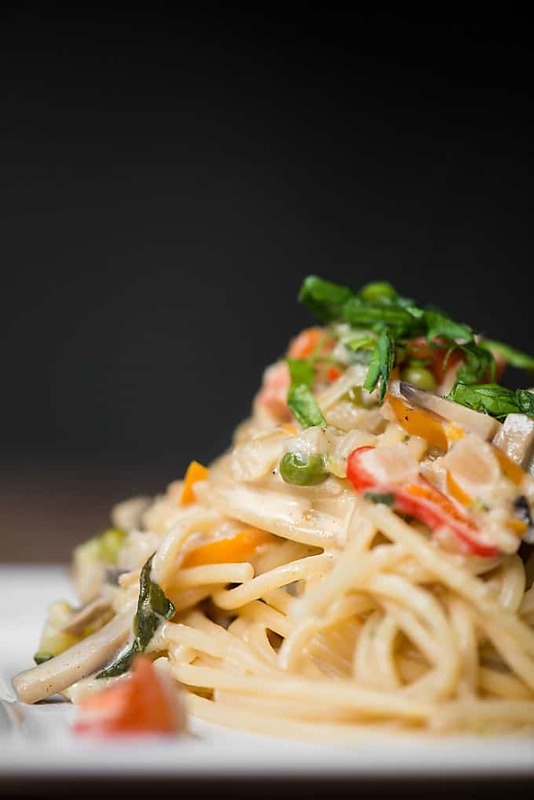 This not only helps eliminate starch, but the pasta will absorb the sauce as well as finish cooking to perfection in the sauce. Are you starting to drool yet? Seriously, how amazing does that pasta look? The night I made this dish, my husband had to work late. I couldn’t bare the thought of him having to reheat this dinner when he got home. I wanted him to enjoy it fresh so I packaged it up and delivered it to him at work. Not only was he thrilled to have a homemade dinner delivered to him (he’s so spoiled), he went out of his way to gush about how good it was. Even my kids, who are normally pretty decent veggie eaters but would be overwhelmed by the thought of twelve different veggies all on one plate, thought this meal was outstanding. Winning. Start boiling a large pot of water with 2 tablespoons salt. Chop up 6 cups of fresh vegetables. In large saute pan over high heat, add olive oil. Once hot, add onion and cook for several minutes, occasionally stirring, until golden brown. Add garlic, stir, and cook for another minute or two until golden brown. 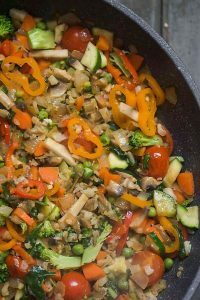 Add remaining vegetables, stir, and allow to cook until tender, about 5 minutes. 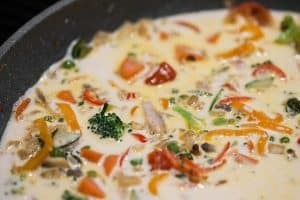 To make sauce, combine heavy cream and chicken broth. Add to the hot vegetables and allow to come to a gentle boil over high heat. Reduce heat to low and allow to simmer for a few minutes. Remove from heat and stir in parmesan to melt. While veggies and sauce are cooking, add pasta to boiling salted water. Time the pasta such that the sauce will be finished by the time the pasta has cooked for 9 minutes. Cook pasta al dente. Drain, and add directly to sauce. Stir to combine and allow hot pasta or absorb sauce for several minutes before serving. Top with fresh basil and serve hot. I love snacking on fresh fruit. My favorite healthy snack is hummus with cucumbers and carrots. I make my own hummus. I do the chickpeas in a pressure cooker with olive oil, salt & pepper. Then I freeze portions in bags. When I want to make some i use roasted peppers, or cilantro or whatever i want to make the hummus with Tahini from Lebanon and lemons from my tree (and more olive oil!) – food processor and voila! I do the same thing with black beans, The best black bean hummus is made with raw green bell peppers & lime juice along with the tahini and black sesame seeds. My favorite healthy snack is roasting chickpeas with different seasonings like curry and spices, they are a great addition to salads or just to snack on. My favorite healthy snack is summer fruits like cherries, peaches, apricots, and watermelon. Yum! My favorite healthy snack is a yogurt smoothie, thanks! My favorite healthy snack is a baked sweet potato topped with almond butter, pecans, raisins, cinnamon, cayenne and honey!